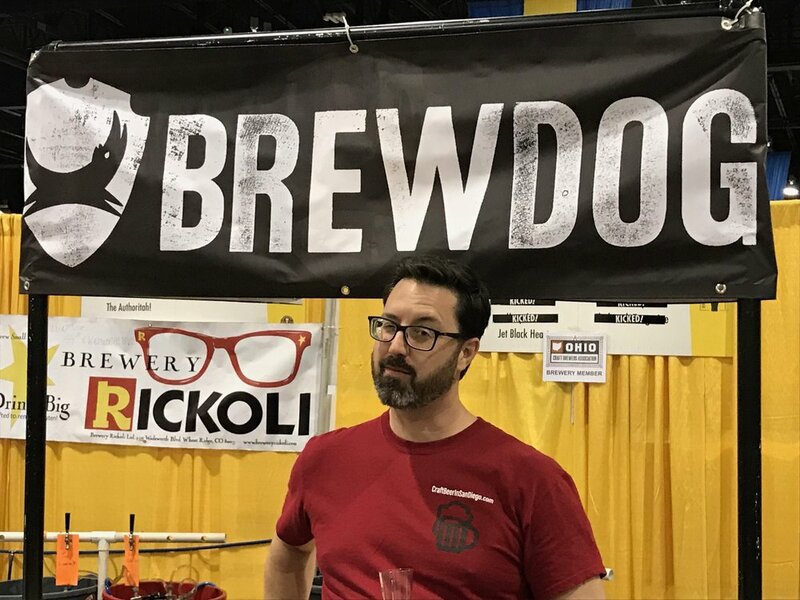 About half of this post also appears on the BrewDog blog page—they sponsored my trip to GABF because I won their 2018 Beer Blogger Geek and America’s Biggest Beer Geek awards. If the huge pens had been full of cows, you would have said, "Woah, that's a lot of cows." Instead, the pens were crowded full of people--twice as many people as there would have been cows, in fact, since we have half as many legs (well, most of us). The other half of the crowd is behind me in this picture. After a long walk around the outside of the huge Colorado Convention Center, through the very efficient security and ticket lobby, and up the escalators, that is your view as you enter the Great American Beer Festival: People, so many people, gathered into pens, excitedly awaiting the start of the event. This year, there were 15,000 tickets available for each of the four sessions (Thursday night, Friday night, Saturday afternoon and Saturday night). You read that right: 15,000. That's a lot of people. Fortunately, the inside of the Colorado Convention Center seems to be even bigger than the outside (#tardis). Also fortunately, they have clearly done this before. There are plenty of security people and volunteers, so the whole thing runs very smoothly. By a lucky accident of timing were let in to a new pen just as it was opened, which meant we got to stand at the front. Our view was better, so we could scope out the floor of the convention hall as we waited, and we were able to hear the brief speeches. I'm not sure people at the back were able to see or hear. Among the speakers were Charlie Papazian, founder of GABF and the Brewers Association, and Governor Hickenlooper, owner of the iconic Wynkoop Brewery, Colorado's first brewpub, opened in 1988. A delightful amber ale (on cask!) at the delightful (and iconic) Wynkoop Brewery. They release the pens (to the fanfare of...a bagpipe band?) on a "first come, first released" basis. That's only fair. And it is a good way to avoid stampedes. It took about twenty minutes between the first group being released and our group being released. That means there is a sweet spot for arriving at the Convention Center. You'll either wait longer before the event starts, or you'll wait longer before your group is released. I know people who arrive 30 or 40 minutes late on purpose, just so they can avoid the waiting altogether. The sessions are so long that missing 30 minutes doesn't really matter. As the folks ahead of us were being let in we tried to strategize about where to go first. It looked like the front corner was least occupied at that point, so once we were released we made a bee-line for the Jameson Caskmates area that was set up there. Our choice was a good one: there were not many people there so we got to sample a bunch of those beers quickly. It was also a slightly bad choice, too, in that all of the beers in that area were aged in whisky barrels, so they were pretty high ABV. It isn't good strategy to front load your night like that. After the Caskmates area, we headed to the alphabetically-arranged tables where the other 800 breweries were pouring. Yes, 800 breweries. Definitely don't pre-game GABF--there are 4,000 beers to try in four-and-a-half hours! Clearly, it isn't possible to try everything. Some people make a list of "must try" beers and map out a route. We decided to make a point of hitting a few specific places when we happened to see them, but otherwise we just wandered and let fate take us to the beer. I liked that approach for two reasons. First, the "must try" places you might put on your list tend to have long lines, and standing in line is not how I enjoy spending my time. (Although, admittedly, lines do help you pace yourself.) Second, there is so much good beer being poured that you can find some pleasant surprises from small breweries you have never heard of. I made a rule to try everything I could, and to not finish anything I didn't love. There are dump buckets and pitchers of water for rinsing your glass at every pour station. Overall, despite the party atmosphere and the copious quantities of beer flowing, I saw only a couple of people behaving badly. I saw one medical call and one person being removed by security. That's pretty good for a drunk crowd of 15,000. At $85 a pop, it seems like the Brewers Association is making a lot of money from this event: close to $5 million in ticket sales alone plus sponsorships and merchandise sales. I'm sure renting the Convention Center is not inexpensive, but the brewers donate their beer. 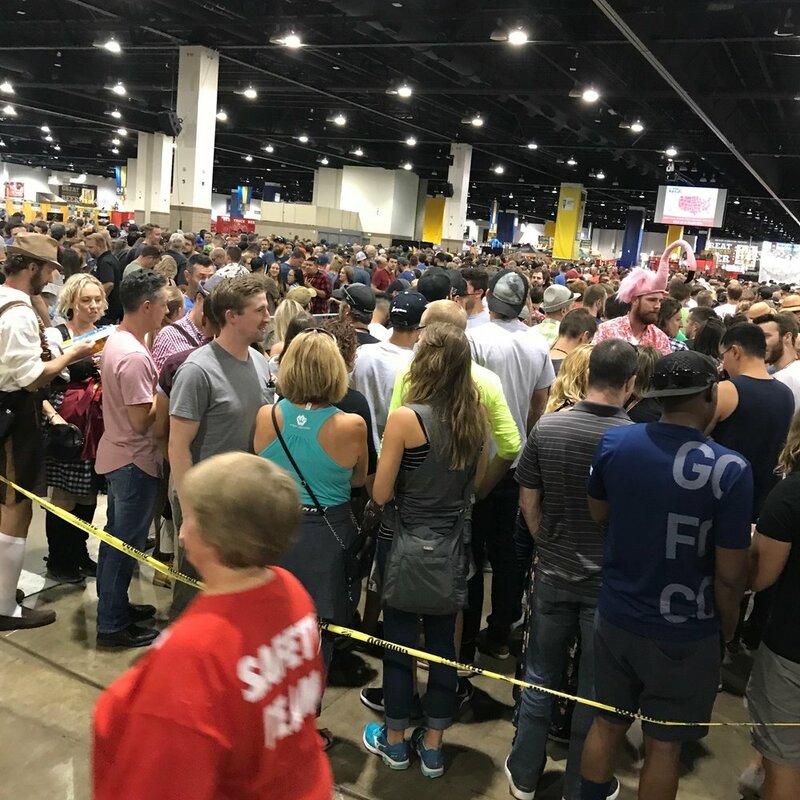 According to the GABF website, the festival also had over 4,000 volunteers who worked almost 69,000 hours to make the it all run smoothly. Cheers to those volunteers! A disadvantage of attending the final session on Saturday night, as we did, is that we saw a fairly large number of breweries that had closed down their stands before the end of the night (including, it must be said, BrewDog). And many more breweries had run out of one or more beers by the time we got to them. It isn't a big deal, really--there are so many other beers available, you certainly won't go thirsty. But if there is something you really want to try, aim to get to that brewery's stand earlier rather than later in the night. After we had sampled 30 (or was it 60?) beers, we were pretty done with the whole scene. It is all a bit of a blur and I don't really remember what I drank. I started the night taking photos of the sign for each beer I tasted, but that didn't last long. I had decided before the event not to log my samples in Untappd or in the GABF app since I wanted to experience the event instead of spending the whole time with my nose in my phone. We left a little bit before the end of the session and headed to a nearby bar, Stout Street Social. The food was decent and we got to try a local saison made by a brewer I follow on Instagram. Denver has a thriving craft beer scene, with many awesome beer bars and breweries. After that, we went with some friends to a tiki bar called Adrift that was hosting a special event for GABF. A lot of Denver bars do that, so you'll find a lot of fun things to do outside of the festival itself. My favorite part of the whole event was running into people I know from the online beer community or chatting with other festival goers. It is just good fun to spend time with other people who love craft beer. We had the pleasure of continuing that fun the next day when we met up with the other BrewDog award winners at Briar Common Brewery and Eatery. Briar Common won an award as Denver’s best brewery in 2018, and I can definitely see why. BrewDog arranged a beer lunch for us and the brewery did an amazing job. The setting is beautiful and the food was excellent. If you ever get the chance to visit Briar Common, be sure to have the fried chicken and waffles! The other winners were all fun, interesting people and I was glad to meet them. Beautiful beer brunch by Briar Common Brewery. After the beer lunch, most of us continued the party at the excellent Black Project, where they specialize in sour and wild ales. We got a little tour of their barrel room, too. Part of the sour and wild beer aging room at Black Project. Our travel arrangements were not ideal. We flew in on Saturday morning, landing just as the medal ceremony finished. The car service that was supposed to meet us at the airport decided not to show up. (Don't use LAXRide: according to online reviews and the experience of several others we talked to, "no shows" like we experienced are a regular occurrence.) Fortunately, we had time to get a train downtown and then grab a pint at the iconic Wynkoop Brewery across from Union Station before getting a Lyft over to the hotel for a 3pm check in. After checking in and a quick nap, we grabbed another Lyft over to the festival. It all worked out, but a flight delay could have been disastrous. I recommend coming for several days so that you don't have to fly on the day of your session and so that you can explore more of Denver and its amazing beer scene.